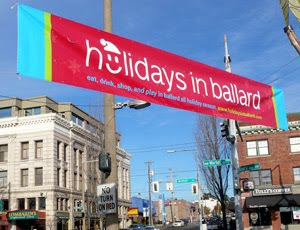 As we're coming to the end of the holiday shopping season, we can now look back on what Design Hovie Studios and the In Ballard Merchants Association worked together to create for the Seattle neighborhood of Ballard this season. We began by bringing together over 60 Ballard merchants who all contributed to fund the campaign. Next we created: a Ballard neighborhood walking map that listed and showcased all the sponsoring merchants, a Holidays in Ballard poster, Holidays in Ballard print and banner ads, hundreds of fun snowflake window stickers, and two large outdoor Holidays in Ballard banners that were hung in Bergan Place Park and on Ballard Aveune. After the collateral was in place, we coordinated the lighting of Ballard and lit trees in Bergan Place Park and in Marvin Gardens Park and lit the historic Ballard Bell Tower. This was the first time in years that the area had been lit and the parks and surrounding shops sparkled. Finally, the In Ballard Merchants Association put on 3 amazing December events thanks in great part to events chair Tiffany, owner of Mon Petit Shoe. On the 5th, they brought in Santa and Jay Dotson Photography took photos of kids with Santa in the old Bell Tower. On the 12th, DJ Vinny put on quite a show, playing a great mix of old and new Christmas tunes in Bergen Place Park. Then, on the 19th, with the help of over 20 volunteers, we lit up Ballard with 1,000 luminaria and made Ballard Avenue even more picturesque by providing horse drawn hay rides down the old brick streets.